Even though they are often mistaken for the same animal, buzzards and vultures are two different kinds of birds. Vultures can be recognized by their bald head and neck, while buzzards have feathers in these areas. One thing that these birds have in common is that they feed on carrion and small animals. They are a threat to livestock, and because they roost in flocks, their feces can soil your property. To get rid of these birds, make their roosting options less inviting and scare them away. 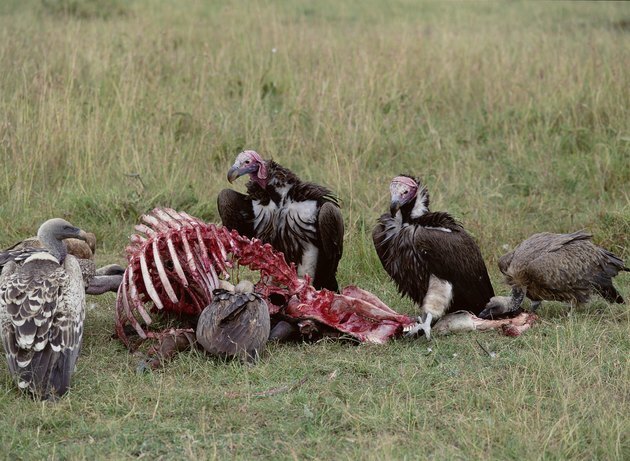 Removing dead carcasses helps keep vultures and buzzards at bay. Obstruct areas where vultures and buzzards roost. Install steel spike strips on areas of your roof where these birds perch and roost. The protruding pointy spikes prevent birds from settling on your rooftop. If trees are the preferred roosting area, remove the trees or cover them in bird netting to keep the buzzards and vultures from landing on them. Move possible food sources out of the pest birds' reach. Move livestock indoors or keep them in a covered, outdoor enclosure. Clean up dead animals on your property because they attract buzzards and vultures. Cover your property with shimmering foil. Parallel rows of foils strips reflect the sunlight. The shimmering effect they create repels buzzards and vultures. Put up bright-colored, scary-eye balloons in areas prone to buzzards and vultures. The balloons temporarily ward off the birds. Use the balloons in conjunction with other repel tactics to get the best result. Harass vultures and buzzards with pyrotechnics. Use a handheld pyrotechnic launcher and fire it at the birds from dusk until it gets dark. Avoid continuing after dark because once the birds have settled, your efforts won't be successful. Repeat the "attack" at the same time for seven days. Pyrotechnics use loud noise to repel the birds, leaving them physically unharmed. Play a combination of different distress calls to repel buzzards and vultures. Aim a distress call player to the area prone to the pest birds and play the alarming cries. The birds that hear the cries are warned about approaching danger. They refrain from coming to the area or staying in the area. Hang a dead vulture or buzzard near roosting sites of buzzards and vultures. When the pest birds see the dead bird, they are scared away. This repel method requires a permit because buzzards and vultures are protected by state and federal laws.